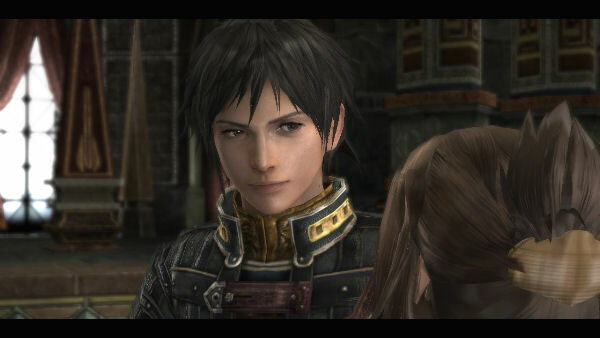 The Last Remnant drew me in right away from the first few seconds. It was beautiful, interesting, complex, everything a good RPG should be. However, after getting past the initial "wow" feeling, things weren't as perfect as they would seem. 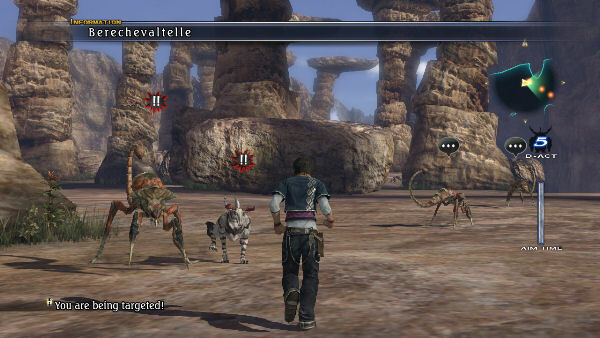 The Last Remnant revolves around the tale of Rush Sykes, a boy on a mission to find his sister, Irina who has been (ready for the cliche plot?) kidnapped. 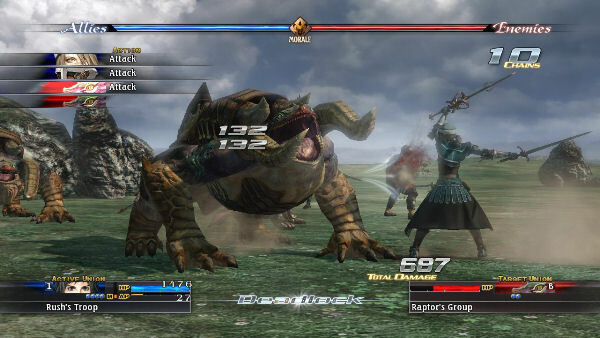 While searching for Irina, Rush finds himself in the middle of a battlefield, which is where you get your first contact with the combat system, and how massive battles can be. It's also where you start seeing how badly the game lags and how slow the frame rate gets. As I said, the battles are massive. You don't exactly control a party, but a whole army. Your army is split into squads (here called unions), each composed of five members (units). 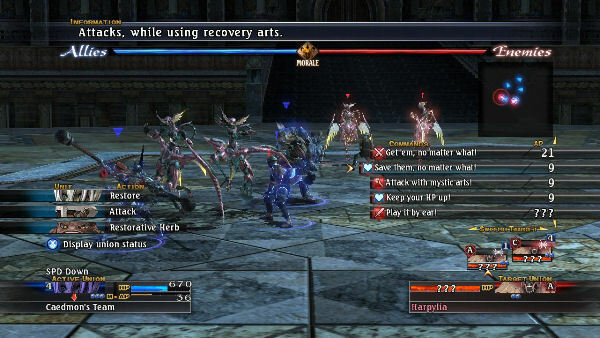 Each unit has its own equipment, stats and arts (the game's versions of spells and combat skills). 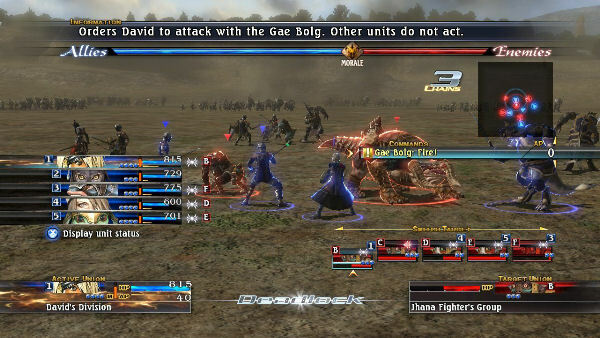 You can arrange their formation, choose the type of attack for the union (and not for each unit as in any other RPG) and then watch them perform their commands. Then the enemy army does their turn, wash, rinse, repeat. The first few battles will throw all kinds of tutorials and plenty of text at you, so learning all these names and commands may seem like a lot to take in in a short time, but after some practice it's not so bad. 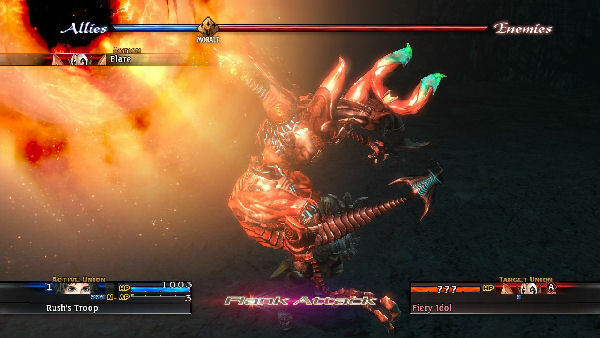 Occasionally, the battle throws at you these timed events where you must press a certain button in the given time to do extra damage. But the massive amounts of stuff going on in the battlefield, the slowdowns and the actual size of the circle and the buttons made these events too easy to miss. 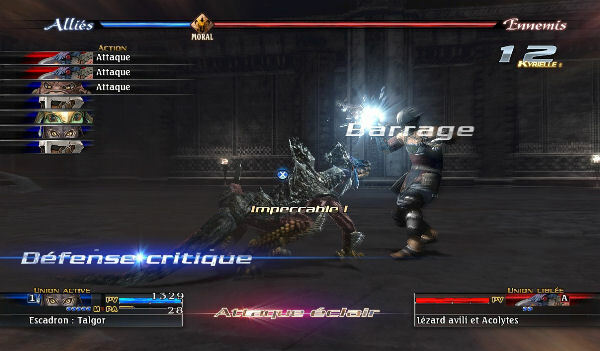 In the later stages of the game, the battles become quite elaborate and epic, to say the least. There is plenty of micromanagement to do when you have a bunch of unions to manage, ponder the terrain, ranged or proximity attacks, arts (the magic spells and skills, so to speak), position relative to the enemy (flank or rear attack), turning what initially seems like a simple turn-based combat into a complex game of strategy. 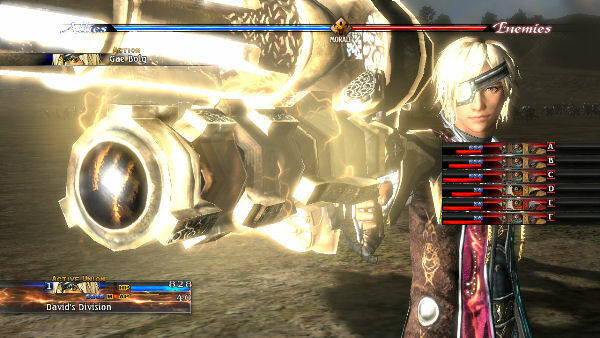 The battles become lengthy and in some cases, they happen one after another, not allowing you to save in between. Ending battles successfully rewards you with experience, items and sometimes money. 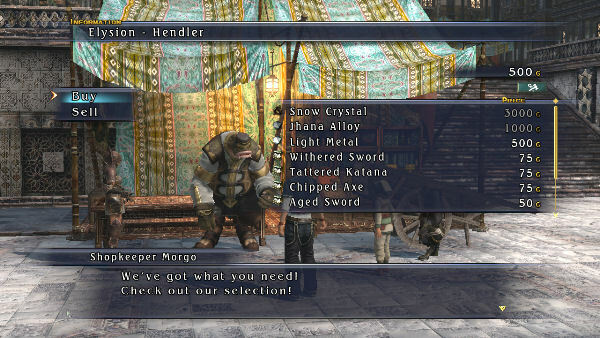 You may even capture monsters and either keep them or use them for parts. 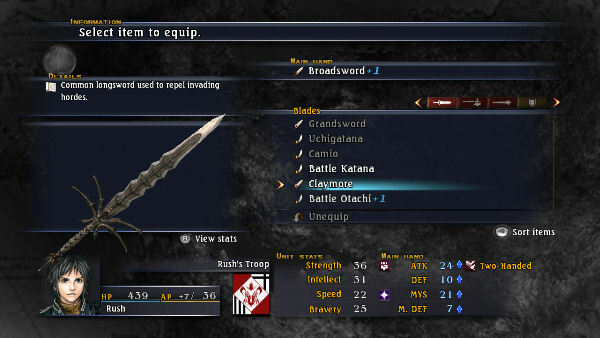 Monster parts can then be used to enhance Rush's equipment. On the technical side, and aside from the aforementioned frame rate issues, there are plenty of loading screens to stare at. Start a cutscene - loading screen. End a cutscene - loading screen. Begin a battle - loading screen. Enter a town - loading screen. The loading times are just annoying, and definitely break the pace of the game. To add to it, there is this issue with the textures loading, while at first everything is blurry, then a pattern seems to appear somewhat subtle, then finally, in come the high res textures. And when everything finally loads in, it's just amazing to watch. I was in awe of the water running down the walls of a cave, the lighting effects, and certain little details on the characters' clothing. But why the problems loading, I don't know. It's not like the 360 can't handle this though, which is a shame, because the game is truly beautiful. As a side note, it seems this problem isn't as bad on the PC version. 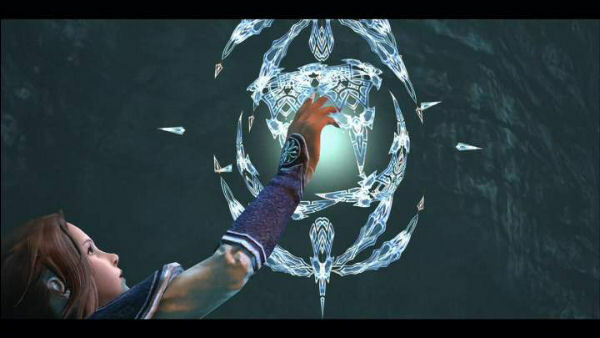 Back to the story, you eventually realize it's not so much about Rush and Irina, but these strange magical artifacts called Remnants, and how the stability of a city can depend on them, plus a strange character called the Conqueror. To me, it seemed like David (the ruler of the first city you visit) was most preeminent, making Rush seem like a secondary character is comparison. 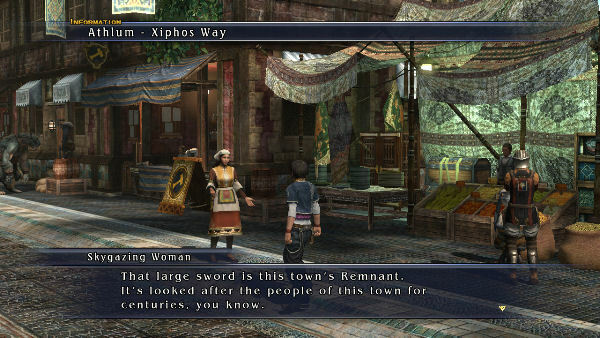 Perhaps because Rush doesn't really have that strong hero personality that usually accompanies a RPG protagonist. Overall, it is the technical issues that take away from what would have been a truly epic tale. Too many loading screens, awful frame rate, and the texture loading issues make it a graphical mess. But if you manage to be patient enough to overlook all that, there are fun battles and a great story to be found under it all.